In a discussion about where a big-name free agent should be calling home come March, one BSPNer believes the new residence should be Tampa. And the player’s name is Le’Veon Bell. One of the best running backs in the NFL, who quit on the Steelers last year, may be a free agent. Joe writes “may” because there are rumblings the Steelers may slap the transition tag on Bell and then trade him to get the last laugh on him jamming them. As you may recall, the Steelers had high hopes for a postseason when Bell decided to play Operation Shutdown because the Steelers franchised him — $10 million wasn’t enough for Bell and so he decided to go jet skiing in South Beach. Yates also added 2018 second-round pick running back Ronald Jones was “a non-factor,” which is very true. Is Bell talented? Damn right. Would Bell be awesome with the Bucs? On paper, heck yes. Personally, Joe wants nothing to do with a quitter. If this dude slammed the door on a strong team like the Steelers, imagine what he would do with just a little bit of adversity here? A guy quits once, he will quit again. He showed his colors in Pittsburgh. What if the Bucs jump out to an 8-2 record and Bell is a big reason for that and all of a sudden, Bell decides to play Operation Shutdown and cry about money? Then what? Sorry, Joe doesn’t trust this guy one bit. And Joe hasn’t even factored in the cost and the Bucs are in a salary cap crunch as it is. Not sure why someone would want a quitter like Bell when Kareem Hunt is unemployed and can be had a for much cheaper cost. Personally, Joe wants nothing to do with a quitter. IF they would part ways with 3 or 4 players to find the money, and IF Bruce Arians could inspire him to where Mike Tomlin could not, how is this guy, the most patient runner in football, going to half-step his way through the backfield until THIS offensive line hopefully provides him with a hole to run through? Pass. Quitter. Expensive. Selfish. Wrong style runner. Cancer. I’ve given up on trying to convince you that he is not a quitter Joe. I provided straight facts about how they got massive production from his rookie contract and extremely high usage. Then they won’t pay the man and secure him long term for what he is worth. Not only does he lead the league in rushing but leads RBs in receptions. This guy should be paid more like a receiver than a RB. In my eyes he is no quitter, but the media painted him that way and you choose to parrot it. With that being said I don’t think WE need to pay that much for a RB with many other holes on this team and with our current cap situation. I don’t know how you afford him, pay hump, sign OL, sign veteran DB, find a new speed WR, and sign all your draft picks. 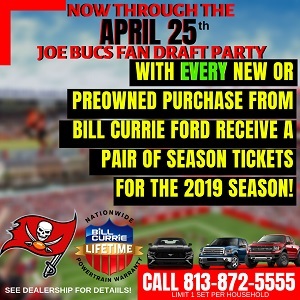 How does a RB who is likely to be suspended for at least 6 games (or more) going to help Bucco Bruce and the Bucs win now? Don’t think Hunt is the answer either. Especially considering how easy it is to stay out of trouble in Tampa! He may be coming to Florida. Just not with bucs. He loves Sourh Beach /Miami area. And they will make room for him if a chance. Could you imagine the distractions there for him ? Bucs don’t have the luxury to sign a rb for close to 15 mil. They can barely resign some of their own players. Trust me …someone will pay him close to that. Or 13-14 range and most /all guaranteed which was his hold up …jets or colts who have closer to 75 mil in cap space ? How does a RB who is likely to be suspended for at least 6 games (or more) going to help Bucco Bruce and the Bucs win now? The regular season is 16-games long. I’ve given up on trying to convince you that he is not a quitter Joe. Where was he when the season started? Jameis was suspended for 3 games and it ruined the season! So what you are saying is the first 6 games just don’t matter because they got 10 remaining? Ignorant much? For that matter if Bell gets us to 8-2 as you described above what does it matter if he quits for the remaining 6? The season is 16 games long smart guy! Lol! Jameis was suspended for 3 games and it ruined the season! For that matter if Bell gets us to 8-2 as you described above what does it matter if he quits for the remaining 6? Dummy, the stretch run games are when the most important games are played. Don’t think the Chiefs could have used Kareem Hunt against the Belicheats? So if your employer refused to pay you what you deserve, that would be ok? Would you not want to seek employment somewhere you are appreciated for your value, oh and many other companies are drooling to have you. But wait there is a way for your employer to keep you there for multiple years without securing you long term. So it is alright for the employer to exercise every available option to get value but when the actual talent tries to do this he is a quitter? Pass in Bell…but not because he’s a “quitter”. I don’t think thst’s A fair label. He was franchised two years in a row. That shouldn’t be permitted. He gambled on himself and played for the Steelers with no contract. He was rewarded with “do it again”. I don’t blame him for sitting. This is a business and this will be Bell’s last contract. He already “took one for the team”. He shouldn’t be forced to do it again. If you don’t think the first 6 games are just as important as the last 6 it just shows how you are the dummy! Don’t you think if hunt is on the Bucs roster they could use him for the first 6 games? Which some of will be division games! And the last games of the season are the only games a team could ever lose without anything to lose. ( depending on playoff position) As teams have been known to sit starting players at the end of a winning season in order to rest for playoffs. So your concept of the last 6 being the “STRETCH RUN” is a bit of a stretch. Does no one think of cap space? We can’t afford Bell. Go get a cheap veteran or two. I agree with you wholeheartedly. I tend to think fans of a team , fans of the game willingly spend their belief that this more than just a business venture. The idea that team is more important than the individuals playing it, that it’s a game , fans demand passion and love of the game from their heros. Fans want to see their own beliefs on display like grit and determination is more important than athletic ability. Great ideas, great values no argument there. But no matter how fans want the game to be, it’s a business. Players want to be paid because they understand that it’s a job. A highly paid job, but a job. Fans want players to cut a team friendly deal, no one asks for the team to cut a player friendly deal. I guess asking billionaire owners that play zero snaps and are guaranteed millions no matter how they perform as owners is just not polite. So fans demonize the players . Why not apply that to school teachers on strike or minimum wage workers. Yeah but nfl players are paid millions, so what that’s the business that they’re employed in and it’s a multi billion dollar business. McDonald’s isn’t the career path if you’re seeking fame and fortune. If fame and fortune is a turnoff then high school football is for you. Bell is more productive than Mike Evans by a long shot , yet Evans has a bigger contract and recieved guaranteed money that pays him more than a guy nearly twice as productive. Oddly, I dont see any issues with his contract. Hard pass on Bell, no for a lack of talent but in Arians scheme RBs are not heavily utilized and Bell is at his best when he’s used as a Swiss army knife. That and there is absolutely no chance we massively overpay a guy who hasn’t played football in over a year. Excellent points TDTB. Didn’t know that Bell had been “franchised two years in a row” & under those conditions I don’t blame him for sitting out. Bell’s only 27 & this will most likely be his last long-term contract. That being said however, it’s a moot point when it comes to the Bucs. We’ve already ponied up way too much money in our quest to purchase ‘weapons for Winston’ (ME13 – $20 mil; DJax – $10 mil; Brate – $7 mil). Plus a 1st rnd pick for OJ & a 2nd rnd pick for RoJo. Add in Jameis’ $21 mil & a pending $7 mil for Hump and we’re talking BIG BUCKS for ‘weapons’ (over one-third of our salary CAP for just 5 players). Bucs don’t have the luxury of adding a RB like Bell costing $10-$15 mil per season. And particularly with the condition of our OLine at present. Pass. We simply can’t afford him……and it’s been a long time since we’ve been in that position….but we are…..the simple fact of the matter is that we haven’t gotten enough production our of our draft picks. We have little cap space and still need to resign Hump, Kwon, DSmith, Backup QB, Kicker, Peyton Barber and the entire 2019 Draft class. It’s like arguing over which car would be better…..a Lexus or Mercedes…..when the bank will only give you a loan for a Kia. Running backs are very utilized in Arians schemes. Do you remember David Johnson’s stats? Arians spread the field and the ball allowing the running backs to have great running and catching stats. Bell would be great, but the price tag is too high. I like Hunt better, but don’t understand the length of suspension. He has already missed 5 games being on the exempted list…now he is going to face many more games suspended? Those missed games should be combined. @onebucperson….have you never heard of David Johnson? Your comment is not accurate….RB is a centerpiece in the offense, it’s what opens up the downfield pass. In his defense he is an NFL RB. Joe screams constantly about the short shelf life of a RB in this league. Do you think Bell doesn’t know this Joe? He is the top runner in the game and probably has at best 5 good years in the league. He does need to try and secure his future now. He will probably have life long health problems once he is done, so he should try to get all he can while he is still in his prime. Bell did not quit. He dealt with the business side of football the way he felt best. Show me one example of him quitting during a game or not giving 100% on a play. Quitting on your team is what djax did. Cmon man, he would never go to a team with a crappy QB. Teams will stack the box and take their chances with the human turn over machine. I just do not get the views on money here. I do not feel sorry for any athlete in the NFL. Bell least of all. 14.5 million for ONE year should make any sentient human being set for LIFE!!! Add in what he’s already earned and what he stands to earn for a few more years and it quickly becomes ABSURD. Our society is so out of whack right now. I sometimes go the Steak and Shake in N. St. Pete. The lady at the register is my freaking age and she works there standing on her feet with an oxygen tank hooked up and the hose in her nose. I asked her if it was tough? She almost came to tears. Her late husband was a self employed man his entire life…she was a stay at home mom, he didn’t pay nearly enough into SS and they certainly weren’t able to save enough…paycheck to paycheck. I feel sorry for HER…not a single NFL player. Guys who I’ve never heard of..Hunter Dimick..Donnie Ernsberger…Ruben Holcomb are all set to earn a half million dollars this year(Spotrac) if they make the team. That’s literally more than the old Steak and Shake lady and her hubby earned in their entire lives in just one year! 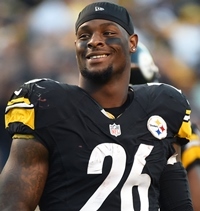 Leveon Bell can bite me. He’s a greedy loser and yes a quitter. I agree with Joe and his former teammates in Pittsburgh who missed the playoffs this year. If we must totally operate on simple greed how many $ did that cost them? You can sign bell all you want but he’ll look below average running behind this o line. Fix the bigger problem… this horrendous o line! I can’t blame Bell for shutting it down in Pittsburgh if they weren’t willing to pay him what he felt he deserved. In the real world you’re always welcomed to quit your job and go elsewhere if you’re not getting paid what you feel you deserve but in sports your locked into a contract and even when you complete your contract term teams still have built in mechanisms to keep you on year to year deals. He played thru a franchise tag last season there was no need to put the extra mileage on his body without any longterm commitments from the team. Now with that said I wouldn’t dedicate 16 mil in cap space to a RB. I’d rather have 2 good RB’s making 8 mil each rather than 1 great RB making 16 mil. No love for Peyton Barber is being shown anywhere. The guy gave his all to this team behind the much maligned Offensive line. He ran hard anytime he touched the ball and remained pretty healthy all season. Upgrade the line and he’s easily running for 1200 or more. No reason to pursue the high priced Bell. Tmax wont supply examples or evidence because he’s a troll. Maybe because Bell might actually play a full year, where it looks like Hunt will play maybe half a year. How are you quitting on your team when you don’t have a contract with that team? He completed his contract and chose not to sign a franchise tag for a 2nd season. I could understand your point if he was in the middle of a contract and decided that he wanted to sit out for more money but that wasn’t the case. Can someone define the word greedy for me? Merriam Webster – marked by greed : having or showing a selfish desire for wealth and possessions. We are talking about 14.5 MILLION $$$ FOR ONE YEAR!!! When is enough..enough? Bell might have thought he was worth 17-20 million…can any of you really imagine the difference between those two numbers. NO and neither can I because most of us are working folks who have dealt in real numbers. The difference in those two numbers could have purchased a penthouse on Beach Drive or Channelside and still has enough left over for a Rolls and a couple of Ferraris? I live in Steeler country and see more Steeler games then the Bucs. I also talk to more Steeler fans then any of you do. Not to mention my significant other is a die hard Steeler fan. BELL IS NOT WORTH THE LOCKER ROOM TROUBLE!!!!! Piece of garbage! And he ran behind an awesome with a run first mentality and HOF QB to help the run game. Kareem Hunt will is far better, even with his baggage. And way cheaper. Joe……….Hunt is sure to be suspended for the first 6 games. Why would you want a RB that can only start Maybe 12 Games? Besides the Chiefs didn’t miss a beat w/o him. They just needed to teach Dee Ford where the LOS is. Lev Bell runs from Sasquatch……. THANK YOU Alaskan! I don’t know why that is such a hard concept to understand. The man WAS NOT under contract so how in the hell did he quit!?!? Why do fans always blame the players and not ownership. It’s either slave mentality or slave owner mentality. You see it all around sports. The answer to the cap issue is so simple. Hire Alexandria Occaso-Cortez as the Bucs capologist, and have her just print more cap space. Joe how do you know Hunt will be suspended for six games? Bell is a quitter. Just what the Bucs need another discontent (DJax) I’d sign Hunt & hope the suspension is no more than three games. Now earning 17.5 million is slavery…because it takes sooo much of your time…what 8 or so months a year. It’s not the same. I do not defend the billionaire owners or the millionaire players. How about the owners invest in a big ticket cut for the fans…how about the owners pay for their own freaking stadia instead of sticking the taxpayer. I don’t care if you wish to call it quitting or simple greed…he bailed on his teammates who missed the playoffs. I would like to know then if those of you who support what Bell did also support Grimes for not wanting to be embarrassed when they are not paying him #1 CB money. What’s the difference? Grimes was under contract. Bell had no contract. Bell couldn’t honor a contract because a contract didn’t exist. Grimes signed cashed the check and then refused to execute certain contractual obligations. Bell technically had no team, therefore it’s impossible to quit on one.